Help the world communicate more clearly, one comma at a time—and earn money doing it! For more than 20 years, Scribendi has provided clients with fast, affordable, and professional editing and proofreading services. Now, we're inviting you to share our mission and earn big at the same time. What is the Scribendi Affiliate Program? The Scribendi Affiliate Program allows you to earn a commission whenever you refer a sale to Scribendi. Every time someone makes a purchase through one of your referral links, you will receive a percentage of the sale as an affiliate. Our program allows you to earn a 10% commission when someone purchases our services within 90 days of clicking your referral link. With an average order size of $100 and opportunities to market our services in almost every niche (after all, everyone writes! ), partnering with Scribendi through the Scribendi Affiliate Program is a lucrative way to make your website and audience work for you. The Scribendi Affiliate Program is for online publishers looking to monetize their website through relevant ads. Because Scribendi offers editing services, our affiliate program is ideal for publishers who target authors as well as the scientific community (e.g., academics who publish papers in scholarly journals). 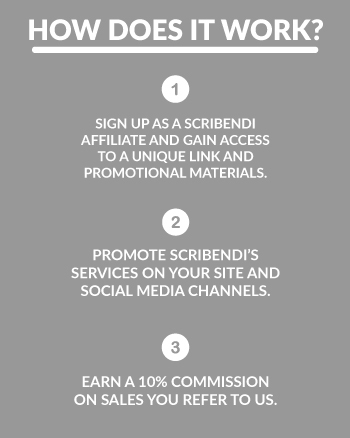 Participating in the Scribendi Affiliate Program is easy! First, sign up through our ShareASale portal to gain access to the unique link you will use to refer others to our services. We'll also provide you with promotional materials, such as banner ads, to help you tell others about Scribendi. Next, simply promote Scribendi on your website and/or social media platforms. You can do this by placing banners on your website, sharing links to our services on Twitter or Facebook, or even writing a blog post reviewing our services. As your friends, colleagues, and website visitors make purchases using your link, you'll earn a 10% commission that is delivered to you through ShareASale. You can promote our services as much as you want, and we'll consistently provide you with new promotional materials to help ensure your success.